Choosing the right charter vehicle for your group event, whether its a corporate meeting, sporting event, or casino bus trip, is an important factor to the success of your trip. You not only want to choose a vehicle large enough to accommodate your group size, but you also want to search for options that offer safety, comfort, and versatility. 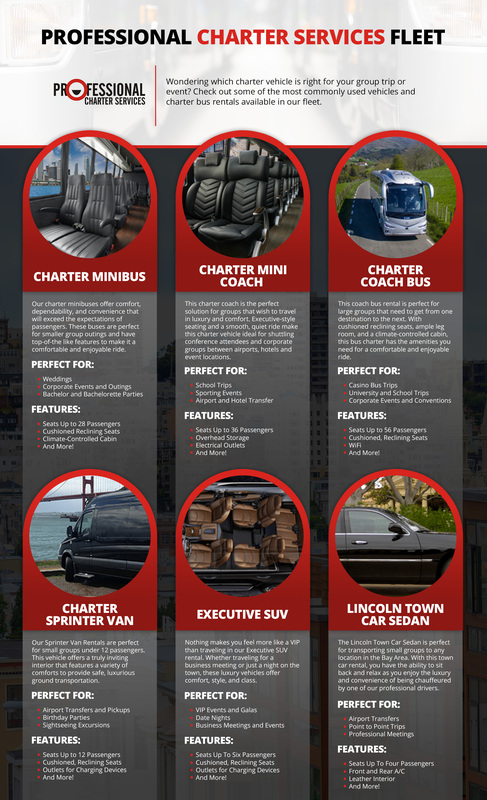 At Professional Charter Services, our San Francisco charter bus fleet includes a variety of different sized vehicles to get you and your group from Point A to Point B safely, in style, and — most importantly — in comfort. If you are planning a group trip or event that requires ground transportation, we understand how challenging it can be to choose the right vehicle. Our friendly representatives are always willing to assist you with your charter bus booking, but to give you an idea of what charter vehicle is right for you and your bus trip, we put together a brief overview of the available options in our fleet. Our 28-passenger mini buses offer comfort, dependability, and convenience that will exceed your expectations. Whether you call it a mini bus, mini coach, shuttle bus, or just a small bus rental, they are perfect for smaller group outings such as sporting events and weddings. This event bus has top-notch features making it a comfortable and enjoyable ride for any event. There is cushioned seating and there is plenty of room to move around and party. Comfortably seating 36 passengers, this charter coach is the perfect solution for groups that require luxury and comfort. Executive-style seating and a smooth, quiet ride make this charter vehicle ideal for shuttling conference attendees and corporate groups between airports, hotels, and event locations. Moreover, one of our professional drivers will ensure that you have everything you need to either relax and entertain your group or run your business as needed. This coach bus rental is perfect for large groups that need to get from one destination to the next. With cushioned reclining seats, ample leg room, and a climate-controlled cabin, this bus charter has the amenities you need for a comfortable and enjoyable ride. This coach would suit large groups for casino bus trips, travel and tours, professional sporting events, and so much more. What’s more, these luxury bus rentals have immaculate on-board restrooms. Professional Charter Services Sprinter Van Rental is perfect for small groups under 12 passengers. This vehicle offers a truly inviting interior that features a variety of comforts to provide safe, luxurious transport for airport transfers, corporate or university campus shuttles, concerts and sporting events, and so much more. When you rent a sprinter charter bus, you get the luxury amenities of a limousine, but with the added benefits of spacious headroom while standing, easy vehicle access through a large exit door, smooth ride and accessible to most locations. Nothing makes you feel more like a VIP than traveling in our Executive SUV rental. Whether traveling for a business meeting or just a night on the town, these luxury vehicles offer comfort, style, and class. Comfortable and leather bucket seats, large storage capacity, and a professional driver are just a few of the great amenities that are included with this executive vehicle rental. The Lincoln Town Car Sedan is perfect for transporting small groups to any location in the Bay Area. The vehicle comfortably sits up to four passengers and typically about four medium-sized suitcases can fit in the trunk space. With this town car rental, you have the ability to sit back and relax as you enjoy the luxury and convenience of being chauffeured by one of our professional drivers. As you can see, we have charter vehicles to accommodate just about any group size or needs. 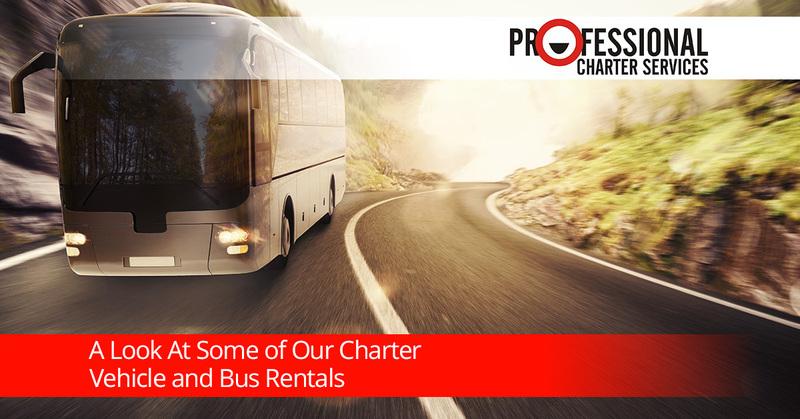 Plus, when you rent charter buses and vehicles from Professional Charter Services, in addition to the various amenities you also get a professional driver to drive you to your destination. Gone are the days of worrying about traffic, parking, directions, and other driving frustrations. No matter what you need one of our rentals for, we have the charter solutions that you need for maximum safety, comfort, and versatility. If you still need help choosing the right vehicle from our fleet or are interested in receiving a free quote, get in touch with us today! One of our friendly representatives will be happy to assist you!